Today, there is a growing demand for designed landscapes—from public parks to backyards—to be not only beautiful and functional, but also sustainable. 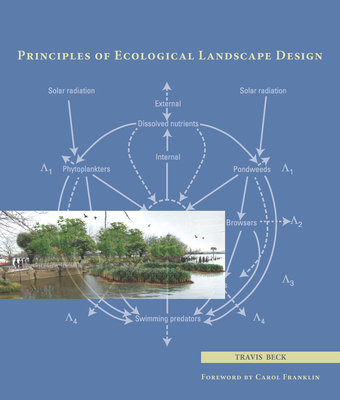 With Principles of Ecological Landscape Design, Travis Beck gives professionals and students the first book to translate the science of ecology into design practice. "A well-researched and scientific explanation of ecological concepts...the author distills what could have been volumes of technical data into clear explanations of key botanical processes...Overall, Beck provides clearly-presented science, ecological concepts and processes, and suggested strategies for implementation. These are not ready-made solutions but provide a solid foundation for designers to broaden their understanding of the ecological principles in nature that can be factored into landscape design." "a practical guide for professionals who are designing and managing ecosystems." "You should make time to read this book." "The book is a laudable contribution that provides a great deal of useful instruction in the planning and design of ecological landscapes." "This important book is not at all dry and academic, although it is largely intended for the landscape professional." "This may be the most important landscape book since Ian McHarg's groundbreaking work, Design with Nature, pioneered the concept of ecological planning....[A]n invaluable resource." "This is a book that encompasses, in great detail, all of the aspects of designing a landscape with ecology in mind. It is a comprehensive manual, both instructional and case study at once... It is a well-written, thorough book which will be more and more important in the future, a must-have for anyone who is connected to creating landscapes." "This book has been needed for decades; there is currently no better guide to ecologically based planting design. Beck has assembled a very readable set of guidelines for planting design, which draws on a remarkably broad research base to help today's designers see their work in the context of living systems far beyond the boundaries of their site." "Principles of Ecological Landscape Design provides a wealth of useful and inspiring information, which will make the book a valuable source for both practitioners and scholars. Beck makes a significant contribution to our expanding body of knowledge about how to create more sustainable places and illustrates how the science of ecology can be effectively employed to advance the art of design." "Finally! Real science for planting projects—design, restoration, urban, or rural. Plant ecology, complex adaptive systems, and landscape ecology concepts are clearly explained and practically applied, with compelling examples. It deals rationally with natives, invasives, and climate change. This book is an essential twenty-first century tool." "Translates the science of ecology into design practice to integrate growing cities into the natural environment"
"These principles should be included or at least considered in all landscape installations ... All would live in a much more sustainable world if the methods presented here were implemented on a wide scale." "A worthy companion and reference for the landscaper, this book deserves to reach a larger audience than it intends." "TRAVIS BECK DID A GREAT JOB. This is a well documented progression of ecological design and its structure in our landscapes. Key points reinforce the importance of understanding the niche, climate, and ecological conditions to design a naturally sustained landscape." "... Beck systematically summarizes both the state of ecological knowledge... and ways of putting it into practice." "This well-timed book is a practical and easy-to-use reference that deftly negotiates the cleft between overview and discrete applications. By understanding the ecological principles presented in the book and adding individual ingenuity and creative license, designers and engineers of the landscape can more effectively improve the productive capacity of the constructed landscape for ecological integrity and the human experience."